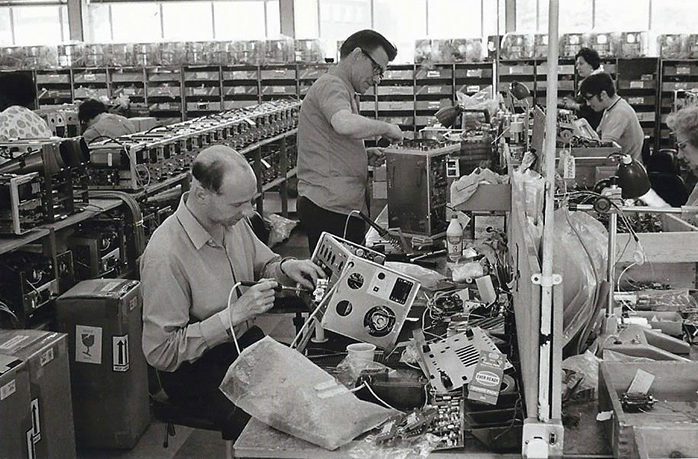 Telequipment was a low cost oscilloscope manufacture located on Pindar Road in Hoddesdon, UK. 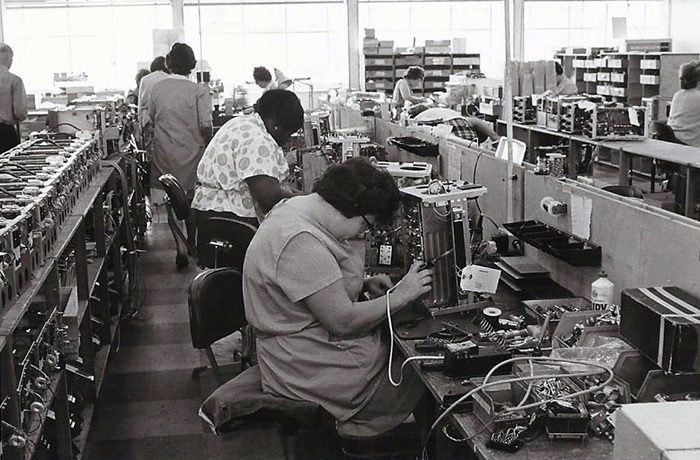 Their equipment was primarily aimed at the television and repair service industry with low cost and low performance products. 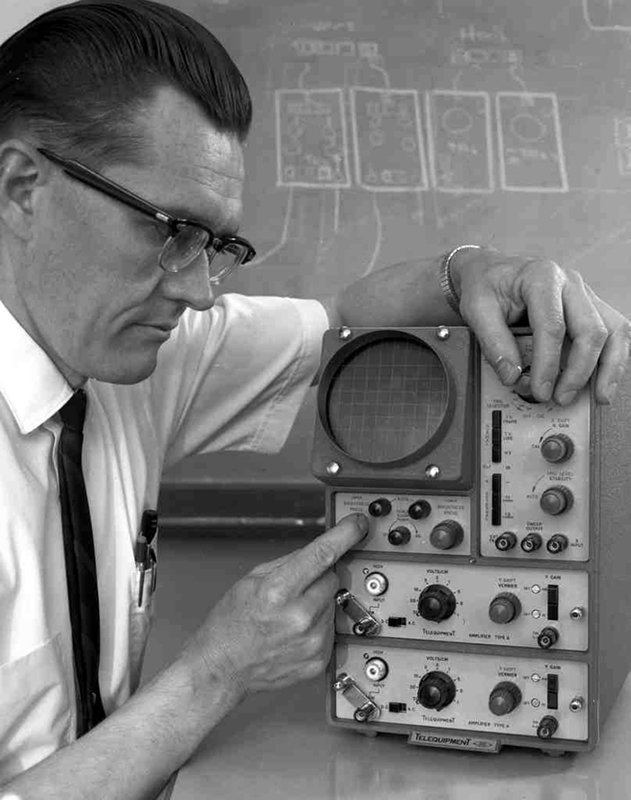 Tektronix was focused on engineering and scientific industries with higher cost and higher performance products. Tektronix had successfully acquired Pentrix to enter the spectrum analyzer market and formed a 50/50 joint venture Sony/Tektronix in Japan. 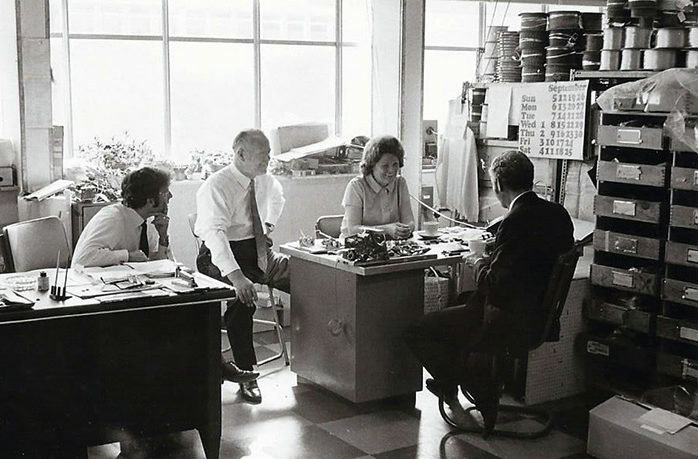 This enthusiasm let to the acquisition of Telequipment in 1967 as a way to enter the low cost market. 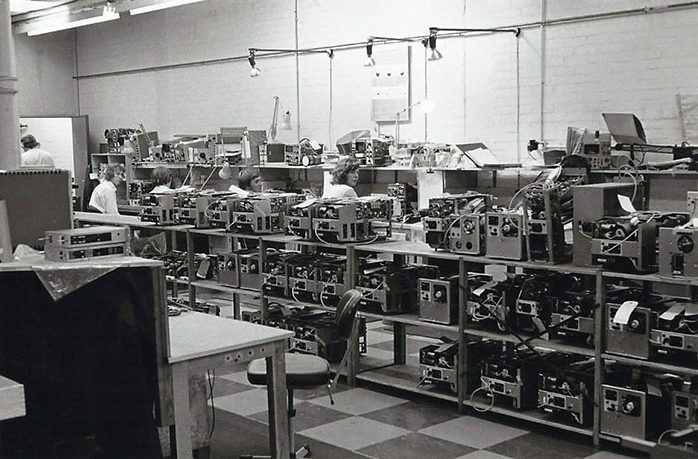 Tektronix did not rebrand the equipment but left it branded as Telequipment but advertising, manuals, and warranties included clear statements indicating that Telequipment was a subsidiary of Tektronix, Inc., to boost sales. This positioning had just the opposite effect with customers expecting Tektronix performance and quality. 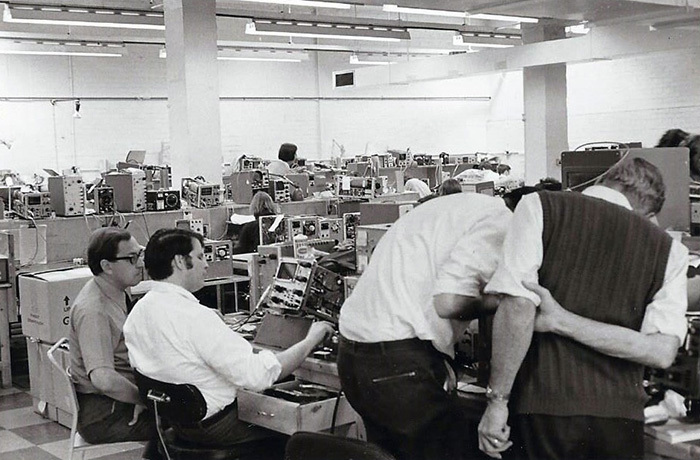 Some Tektronix distributors even refused to carry the Telequipment line. 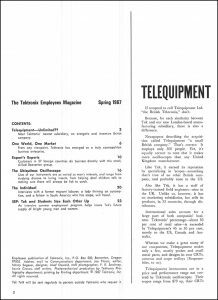 This Spring 1967 TekTalk describes the history of Telequipment. Click on the image to view the PDF. 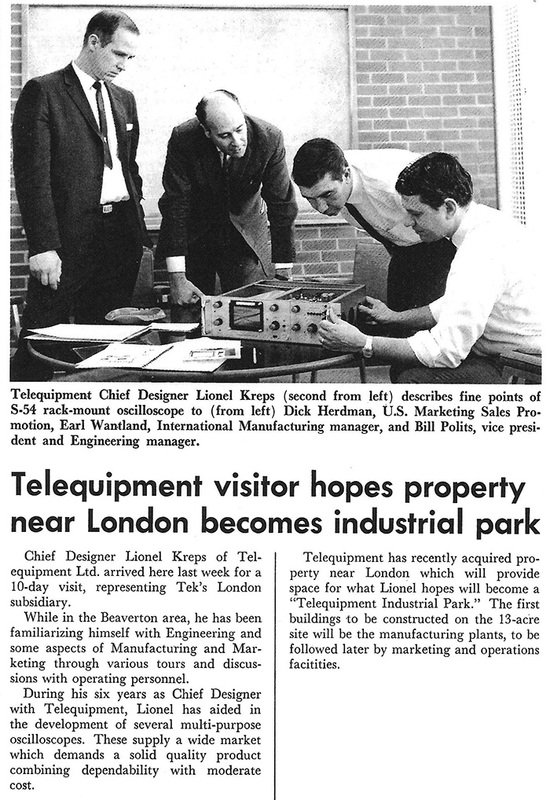 This December 8, 1967 TekWeek article features Lionel Kreps who was the chief designer at Telequipment. 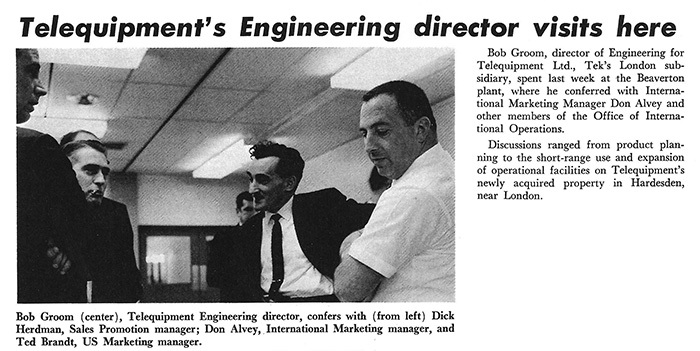 This January 19, 1968 TekWeek article features Bob Groom who was the Engineering Director for Telequipment. 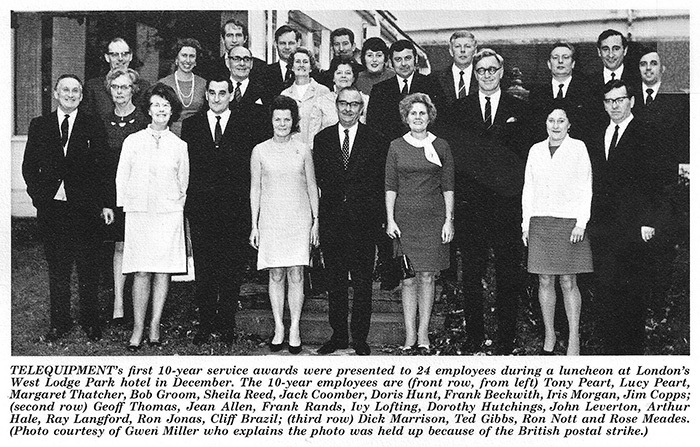 This February 26, 1971 TekWeek features Telequipment 10 year anniversaries. 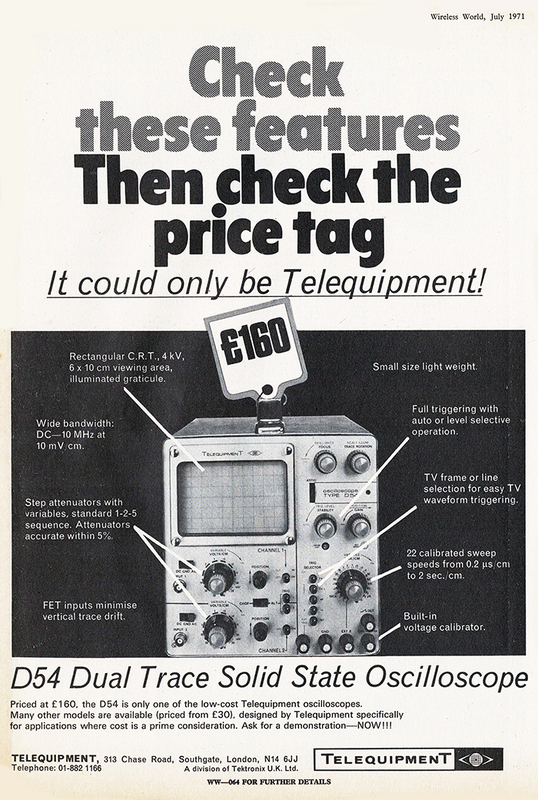 This ad for a Telequipment D54 appeared in the July 1971 issue of Wireless World. 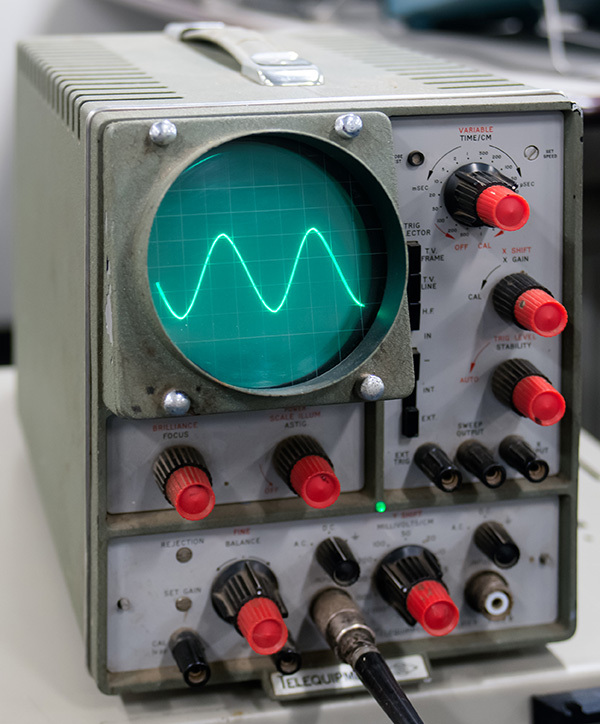 There is a photo of a D54 on the Tektronix In Music page. 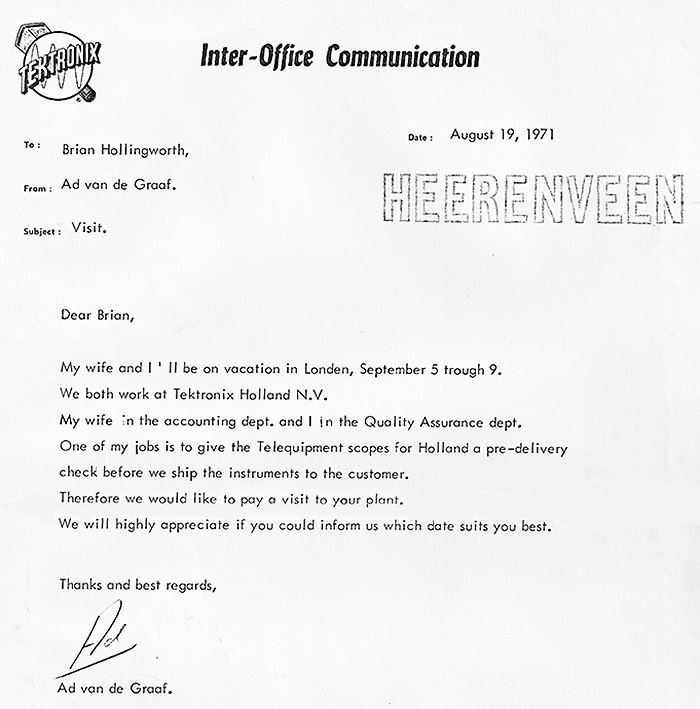 This August 19, 1971 IOC from Heerenveen requests a pre-production visit from the QC department. We have a Servicscope S51E on display at the museum. 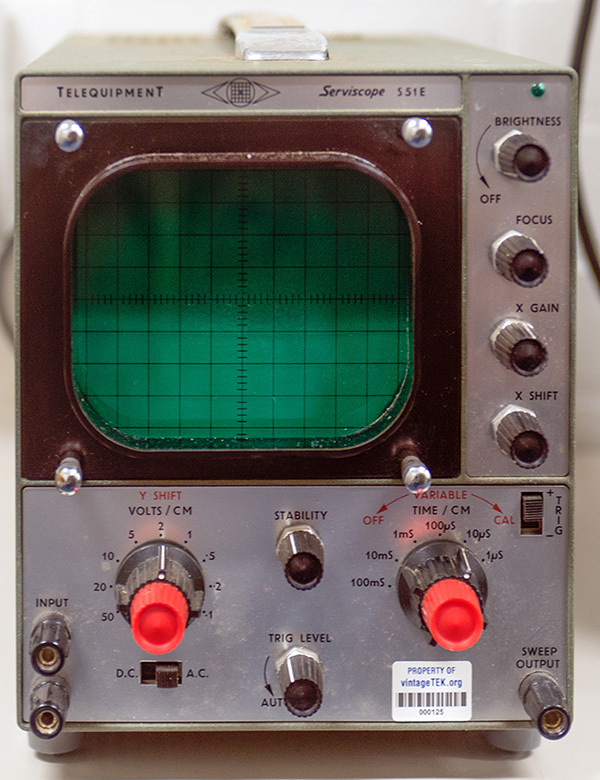 The museum also has a Telequipment S43 4" CRT single channel oscilloscope. It had been hoped before the acquisition that there would be some "rub-off" effect where Beaverton would gain some low cost design methodologies but this never occurred through the acquisition. 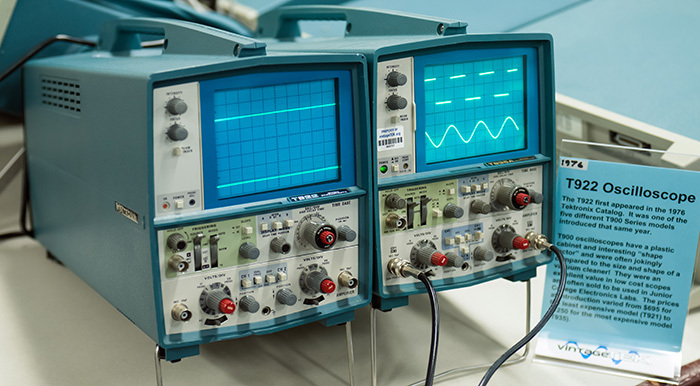 Instead Beaverton took responsibility for defining and setting specifications of oscilloscopes that Telequipment would design and manufacture. 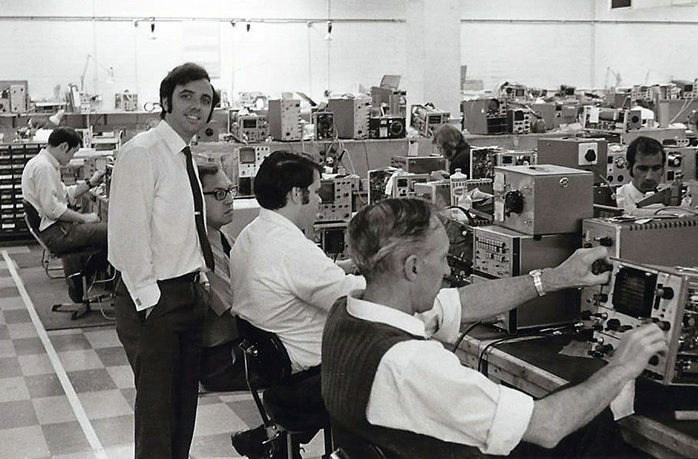 In 1976 Telequipment introduced a superior 30-megahertz scope but in 1978 the decision was made to terminate the Telequipment line as Tektronix had already produced a T-Series line of low cost oscilloscopes. The T-Series picked up the nickname of "hoovers" because of their similar appearance to a Hoover canister vacuum cleaner. 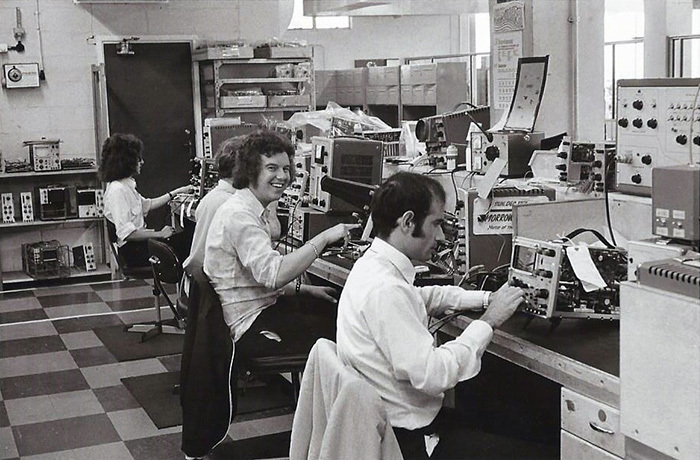 Tektronix did leverage the Hoddesdon facility and began to build Tektronix products on the site. This continued until 1988 when production of the 2200 series moved to Heerenveen and the site was shut down. 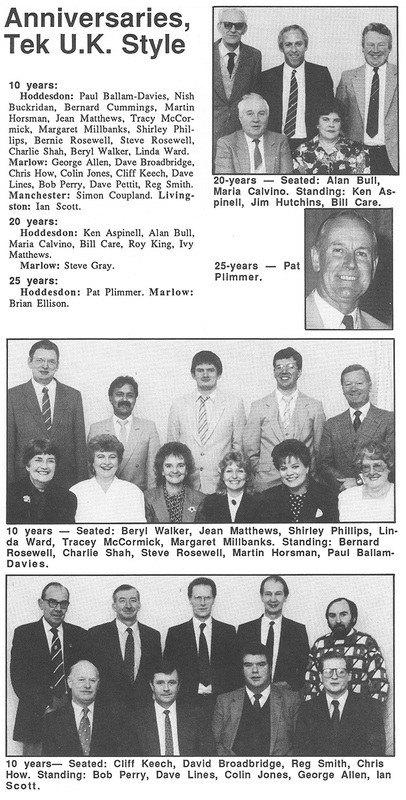 This February 24, 1989 TekWeek featured 10, 20, and 25 year anniversaries at Hoddesdon. 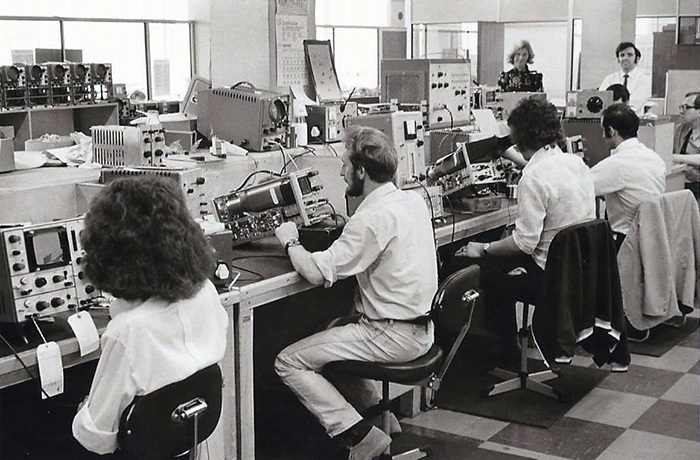 These photos are of the Telequipment factory, date unknown.